One of the more interesting "conversation pieces" to keep in an extension office, natural history museum or home is the nest of the baldfaced hornet. The baldfaced hornet is a social wasp found in the familiar large, gray, paper nests attached to a tree branch, shrub, utility pole or house. The paper-like nests are made of chewed wood fiber mixed with saliva. 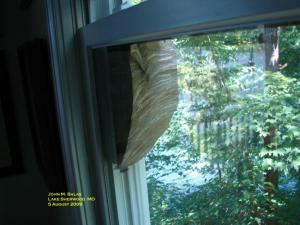 Below are answers to the most common questions about displaying a hornet's nest. 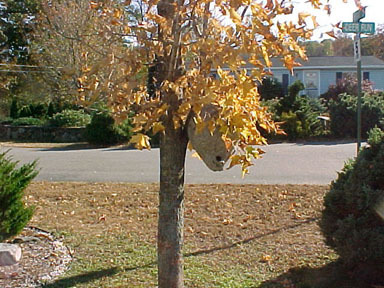 The easiest method of collecting a nest is to wait until after the hornets have abandoned the nest in the fall (after the first hard freeze or by late October). 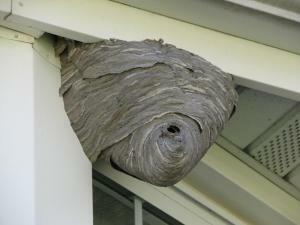 Hornet nests are annual; they last one summer and all occupants freeze or die of old age in the fall. Collect the nest as soon as possible because exposed, unprotected nests are subject to destruction by wildlife and weather. There may be few, if any hornets in a nest collected in late fall. If you feel the need to be extra-cautious, leave the nest in a garage or porch where it will be protected from the weather until mid-winter. Then bring the nest indoors. No. Hornet eggs laid inside the nest by the queen hatch into grublike larvae that must be fed and cared for by the workers. If any eggs hatched indoors, the tiny larvae would perish. Links to this article are strongly encouraged, and this article may be republished without further permission if published as written and if credit is given to the author, Horticulture and Home Pest News, and Iowa State University Extension and Outreach. If this article is to be used in any other manner, permission from the author is required. This article was originally published on October 4, 2006. The information contained within may not be the most current and accurate depending on when it is accessed.